AS WAS THE NORWEGIAN CUSTOM, Hakon, son of the aged Harald Fairhair, was fostered to England’s king, Athelstan. Across the North Sea, Hakon not only took on English customs but also its Christian God. When his father died, the 15-year-old Hakon sailed for Norway to claim his kingdom and bring his Christianity to Norway, 45 years before Olaf Trygvesson. When his rival (and brother) Erik Bloodaxe was killed by the English in 954, the Christian youth took Norway’s throne. "King Hakon was a good Christian when he came to Norway,” writes Snorri Sturluson in Heimskringla (c. 1220). “But as the whole country was heathen, with much heathenish sacrifice . . . he resolved to practice his Christianity in private . . . It was his intent, as soon as he had set himself fast in the land and had subjected the whole to his power, to introduce Christianity.” But that time never came, and when he did try to encourage Christianity, local chiefs complained that he was trying to take away their freedom. The opposition became so fierce that Hakon’s rule was threatened. He decided he didn’t have the power to force Christianity upon his country, so he allowed his subjects to continue practicing paganism. But that was not enough, and the chiefs, to ensure that Hakon was a true pluralist in religion, demanded that he sacrifice to the Norse gods. Hakon complied. To satisfy his conscience, he made the sign of the cross over the sacrifice (though he said publicly he was making the sign of Thor’s hammer), but eventually he forsook the charade and made straightforward sacrifices to the pagan gods. 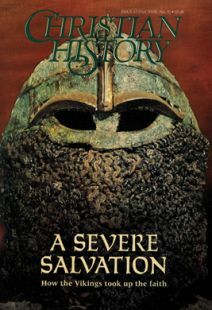 Even though he proved a faithless Christian, Hakon was treated well by later Christian historians. His title of “the Good” did not refer to his spiritual state, though, but to his innovations in law and justice. He voluntarily limited his autocratic power while strengthening his standing as a nationwide king by building up the Lagthing (local advisory groups) to consult on national law. He also reorganized his coastal defenses to protect Norway from Denmark. Hakon the Good was succeeded (after a bloody battle) by Harald Greycloak (the son of Erik Bloodaxe, whom Hakon had defeated decades earlier). "Harald Greycloak, or Greypelt, was clearly a man of character and authority,” writes Viking historian Gwyn Jones. But ultimately, Harald was judged a failure as a sovereign. Why? First, his Norwegian subjects discovered that he’d won his throne with the help of Harald Bluetooth—a Dane! More important, Harald Greycloak was a Christian unlike the politically savvy Hakon; Harald retained his Christianity and fought harshly to stamp out Norway’s paganism. Naturally, his subjects, who thought these actions offended their gods, were angered in turn. A series of bad harvests and years of rotten weather deepened their animosity toward Christianity and their sovereign. At the same time, Harald, described as “very condescending, and full of fun” by Sturluson, felt the chill of Harald Bluetooth’s waning affection on his southern flank. Eventually, sources say, Harald Greycloak, his power base severely weakened, was lured to northeast Jutland and killed. When Stenkil, a Christian, took the Swedish throne, his country was still a stronghold of pagan worship. In 1060, two Swedish bishops, Egino and Adalward, came to their Christian sovereign with an ambitious plan: promote Christianity by demolishing the heart of pagan worship—the Uppsala temple. This would strike right at the heart of Scandinavian paganism. Christians everywhere lamented “the Heathen Temple at Uppsala,” including church historian Adam of Bremen. A mere decade after Stenkil’s death, he wrote, “Those who have already adopted Christianity redeem themselves at [Uppsala] ceremonies"— meaning these new converts were covering their religious bases by sacrificing to pagan gods. While sympathetic with the bishops’ zeal, Stenkil, though a firm Christian, turned down the idea. Not only would the bishops be killed, he himself would probably be exiled, and subjects who had converted to Christianity would undoubtedly revert to paganism. In short, destruction of the Uppsala temple would be a political and evangelistic disaster. The bishops saw his point but persisted, going to regions where they felt paganism was weak and destroyed many local temples. After Stenkil died in 1066, though, even these “victories” were reversed. The Swedes drove out the antagonistic bishop of Sigtuna, and, as Stenkil had foreseen, paganism returned fullforce. When his son, King Inge, refused to sacrifice to the gods at Uppsala in the 1080s, he was banished from Sweden and its throne. Georgia Beaverson is the author of the forthcoming novel The Hidden Arrow (Random House, 2000).